Even Sweeter Dreams: A sweet dream coming true! Hi my friends! 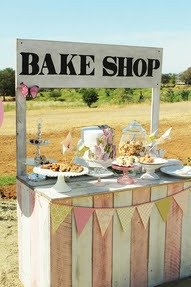 As some of you may know, baking is one of my passions and I have had a dream of opening my own shop for quite a while. I have dedicated quite a few blogposts about it haha. Like this one here. Some days ago I told you about a new baking adventure that was about to start for me. I can now share this great news: I am starting my own cateringcompany! I am super excited about it and I am so happy I get to share this with you all! The company is called Sweetie Pies, and I will sell my homemade cakes, pies, brownies, cupcakes and so on. I will also host High Tea's (my favourite!). In a short while I will also create a webshop, where anyone anywhere can purchase lovely tea (think cupcake tea, banana-honey tea and chocolate-mint tea just to name a few!). My mum will be designing the logo and make some lovely drawing to put on the website. I will use that logo to make bussinesscards and flyers, to promote Sweetie Pies. It's all really exciting! Once the logo is done and the website is up and running, I will defenitely share this with you as well. It's a fun journey that I am starting, and I am inviting you all along!